Looks like winter is finally hitting us here in the Great North! Oh, joy, oh bliss, let’s shovel snow! Always an optimist – on a positive note – the snow signals COCOA SEASON! Love my cup of heart healthy hot cocoa. Yes, depending on the ingredients, cocoa can be the perfect winter drink for your heart and your soul. Having cocoa made with 2 cups (500 mL) skim milk and 5 tbsp (75 mL) high antioxidant cocoa powder (aka raw or natural cocoa powder) daily is a useful tool against the risk factors of coronary heart disease so says a report in Nutrition, Metabolism and Cardiovascular Diseases published in 2012. Although the number of participants was small (42 adults) after the end of the 4 week study the researchers found that the daily drink of skim milk plus cocoa was associated with a 5 percent increase in HDL cholesterol levels (that’s the good stuff), compared to only milk and a 14 percent reduction in oxidized LDL cholesterol levels (that’s the bad stuff), compared to milk only. 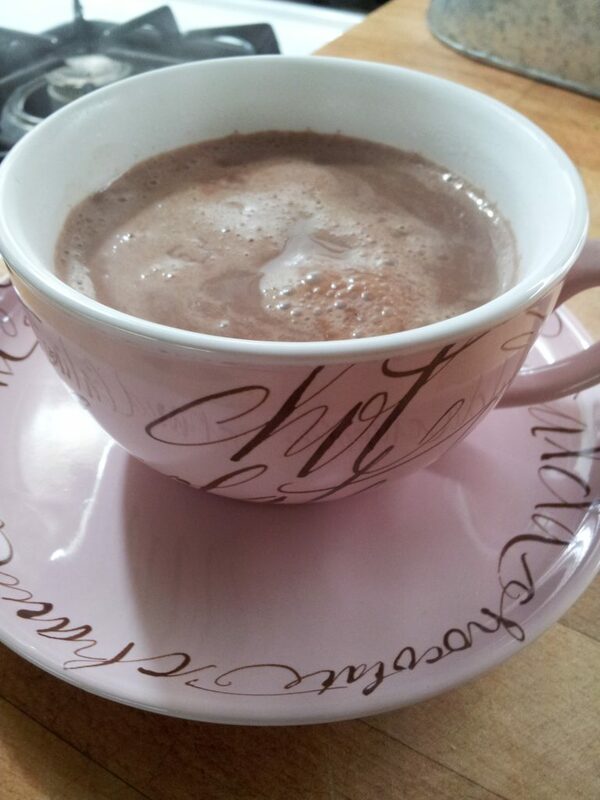 In English – that large cup of cocoa raised the good HDL cholesterol and lowered the evil LDL cholesterol. Not bad for a treat! I’m all about “having your cake and eating it too”! So here’s my recipe for a cup of heart health! My recipe only calls for 1 cup (250 mL) of milk and 2 tbsp (30 mL) which is a little less than half of what the researchers used in their study. One of my pet peeves is how cocoa and hot chocolate get bantered around in the same sentence, as if they were one and the same. Hot chocolate is made from melted chocolate and cocoa is made from, wait for it, cocoa powder. Here’s how I make a cocoa mix from my web cooking show My Left Frying Pan. Natural cocoa powder is higher in flavanols (those powerful antioxidants that can help reduce your blood pressure) than regular cocoa powder. Read your labels. You want a product that says natural or raw right on the front of the package. My recipe isn’t overly sweet, so give it a taste and add a little more sweetener if you need to. Heat the milk on top of the stove, on medium, or in the microwave, on low until steamy. Whisk in cocoa powder and sweetener. Serve. To reduce the total amount of carbs to 42 g and the sugars to 31 g, use unsweetened organic soy beverage. My brand of choice is Canadian grown Nautr-a. Or use half the sweetener. People living with diabetes feel free to use stevia instead of honey. Thanks, Mairlyn. I’ve been trying different brands of stevia. Why do you like the Splenda brand best? I don’t think I’ve tried that one. It doesn’t have that weird after taste. What about caffeine? I am totally decaf. Is there much? Decaf shouldn’t bother you, but having said that I can’t have a decaf latte in the afternoon without it playing havoc on my sleep. Yikes! I’m super caffeine sensitive.